Matt Turner from New Westminster, British Columbia, took home the first place prize. Big Smoke Las Vegas attendees had just finished a hearty breakfast before they returned to the Mirage Hotel & Casino conference room and were handed a dark, slightly wet tobacco leaf. "The Vegas air is dry, so keep it balled up in your hand, keep it moist," members of team La Gloria Cubana told attendees as they filed into the room. "Now, who's ready to roll some cigars?" The hour had arrived for Cigar Aficionado's famed "Roll your own" cigar seminar, hosted by Michael Giannini and Leo "The Pope" Peraza of General Cigar Co. The tobacco distributed at the door was wrapper leaf destined to be rolled by eager audience members over a combination of filler and binder tobaccos called a "bunch." Each amateur roller was given a hard plastic table mat, razor blade, a cup of vegetable glue (called gomma), and as a special bonus: either a La Gloria Cubana Wavell or a La Gloria Cubana Serie N JSB to smoke while working at their rolling station. 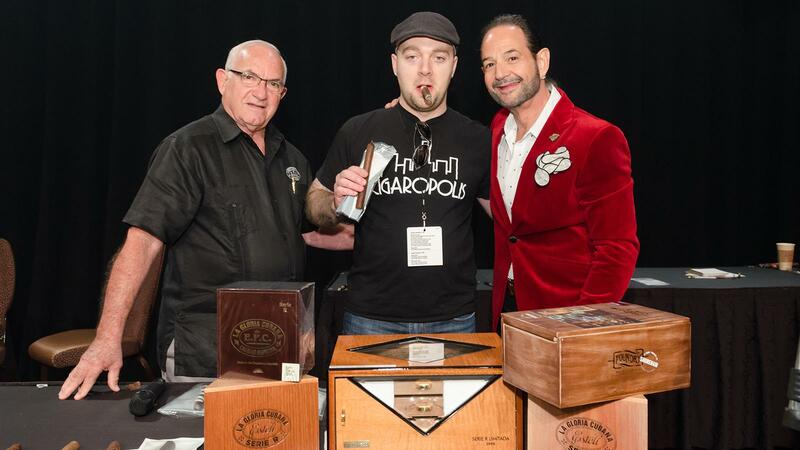 Guided by the voice of Giannini and the hands of Peraza, one of La Gloria Cubana's most experienced premium cigar rollers, attendees watched on two large projection screens as the master craftsman began to stretch the tobacco leaf with his fingers. "Watch Leo," Giannini told the audience, "Take your wrapper, lay it in front of you. Watch how he delicately stretches the wrapper. You want to stretch out all the wrinkles." Many audience members effortlessly completed the first step. Confidence levels were high, and the sound of light chatter, along with puffs of smoke, rose into the air. "Now pay attention to this next part," Giannini said. "Normally you would use a chavetta—you have to use these tiny little razorblades. We're going to cut the wrapper." Peraza reached offscreen for a moment, and his hand returned with a large half-moon-shaped blade, a traditional cutting tool called a chavetta. In a quick fluid hand motion, Peraza trimmed the edges of his cigar wrapper. "I'm seeing some really good first cuts," Giannini said. "Ready for the second cut?" The audience murmured an affirmation, but it was clear from the sound of their voices that doubt had started to set in, and some had overestimated their skills. The crowd watched as Peraza's blade sliced through the middle of the tobacco leaf in a graceful arc. "There you go—now you've got a half-moon. Now, look at your wrapper. The veins should be up. If you can't see the veins [of the leaf], flip it over." Giannini said. It was time for the audience to apply the freshly cut wrapper leaf to the bunch, using only their hands and a touch of gomma. "Ok, when you're rolling—opposite hand stretches, the other hand rolls. This is the hardest part of rolling a cigar. You want to get it in three rolls. First, roll with your thumb, let the wrapper twist itself." Projected onscreen, Peraza's hands gracefully worked the wrapper, encapsulating the bunch in three turns and twisting the excess leaf into an impressive pigtail cap. "It's easier smoking cigars than it is to roll them—that's why I don't roll," Giannini joked as he watched Peraza. He then turned back to the audience. "Now, If you've rolled a cigar that you're proud of, that you would buy at a store and pay six dollars for...Or if you think you have a cigar that's really funny...come on up to the judge's table." A large portion of the audience rose and handed their cigars off to Giannini. As the table filled to capacity, it became apparent that some of the novice rollers had worked together, combining their cigars to form monstrous or fascinating creations. Some of these inventions included a military tank, a fighter jet, a Santa Claus and a Thanksgiving turkey. "I have no idea what this has to do with cigars," Giannini said of the tobacco turkey, with its tail feathers a complete and colorful fan of cigars, "but it's very creative." Boxes of cigars were given as prizes to the entrants whose sculptures made Giannini laugh or cringe. But he also rewarded the rollers whose creations were aesthetically pleasing and rolled in the traditional style that Peraza had demonstrated. For the cigars that required the most skill, patience and craftsmanship, Giannini saved his best prizes. The first place winner, Matt Turner from Canada, won a rare 2005 Serie R Limitada humidor, two boxes of Serie R Esteli, a box of La Gloria Cubana Serie R No. 5 and a box of Foundry War of Currents Shoreham. In closing, Giannini thanked the audience for their participation, as well as General Cigar, Leo Paraza and Team La Gloria for all their support in making the 18th year of "Roll your Own" a success.